» Red-light cameras: Keep them or …? Red-light cameras: Keep them or …? Cameras keep an eye on traffic at Queen and Geary last week. 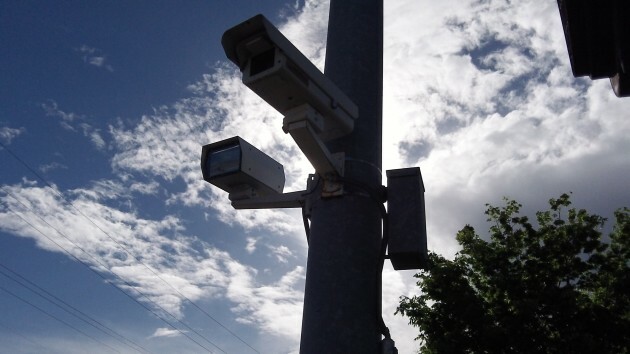 Some jurisdictions across the country have been dismantling red-light cameras, but in Albany the police chief would like the council to authorize renewal of the city’s contract with Redflex Traffic Systems for another seven years without competitive bidding. Albany contracted with Redflex in 2007 to operate two sets of cameras to catch red-light runners at Queen Avenue and Geary Street (west on Queen and south on Geary). The contract, extended in 2010, expires in February 2017. The extension requested by the chief would allow for “seven additional approaches” (streets feeding into intersections), which he says is the same as the current contract language. No other intersections have been so equipped, however. 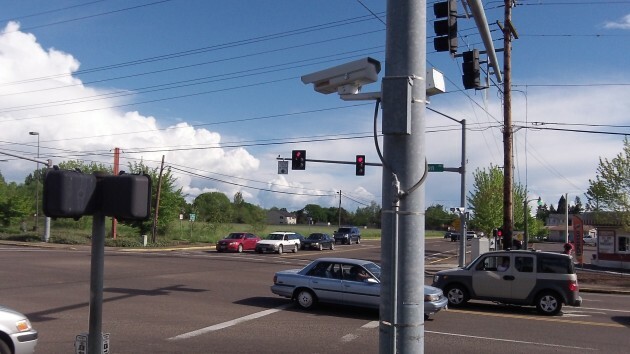 At the time of the original installation, there was talk that putting cameras on state highways such as Pacific and Santiam would require ODOT approval, and this was deemed too complicated. Red-light cameras have been controversial for a long time. In recent years they’ve been removed in lots of places and retained or added in others. An online sampling shows that camera systems were removed in Gulfport, Fla.; Round Rock, Texas; Tucson, Ariz.; Las Cruces, N.M.; Aurora, Ill.; and Littleton, Colo. The Redflex website tells of others, including Sacramento County and Ventura, Calif., where they’ve been renewed or started. This January, the state of Florida published a report saying that in cities that had installed the cameras, collisions increased afterward. Total crashes were up 15 percent; rear-end crashes were up 10 percent. and incapacitating injuries were up 29 percent. The report did not blame the cameras for the increase. It said other factors may have been at work. Redflex, for its part, cites other studies including one by the insurance industry that the cameras have saved lives. I asked Lattanzio for statistics related to the cameras at Queen and Geary. He told me to wait till Wednesday, when he presumably plans to give the council information to back up his request. When a camera snaps a red-light violation, an officer reviews the images and determines whether to send a citation to the vehicle’s registered owner. When I wrote about this in January 2015, the police told me that camera citations at the intersection numbered 499 in 2013 and 500 in 2014. But not all of them resulted in fines being paid. Some were dismissed and others weren’t paid. Redflex, I was told, averages $60 for every $260 ticket that is upheld and paid. And in fiscal 2013-14, the city collected $32,500 in camera tickets. Traffic at Queen and Geary, a busy intersection most parts of the day. I like every kind of technical whiz bang which can improve cars and driving, all the way to when drivers are totally unnecessary. So, I SHOULD like red-light cameras, but somehow I DON’T. They bring back creepy memories of when I was under the very mistaken belief that the numerous miniature-rifle-like gizmos were actually red-light cameras (they’re probably low-resolution video cameras used to control traffic lights). I was going to get a bill some unknown time in the future for not quite making it all the way across before the light turned red, along with a bazillion dollar fee from Hertz buried somewhere in their unreadable contract. A reason for my paranoid delusion, and many other peoples’ bad attitude toward automated enforcement, is that technology can have a multiplying effect on bad will; a good example is the ever-increasing difficulty of solving a service problem when you can’t get a real person on the phone and none of the programmed options are relevant. The solution to both red-light running and its horrible consequences – and red-light cameras – will come when seeing the light and deciding what to do is no longer dependent on the weakest link, the driver. Coming soon. Get rid of them! Follow the money, somebody is getting paid. Surely some of you can agree that a publicly traded company profiting via law enforcement is no good! HH, I’d be interested in more data on the Albany locations where they are installed. Ticketing info is fine but more granular like accident rates before installed contrasted with after. Were/are there instances where the cameras helped solve crimes other than traffic. Still won’t change my mind that they should go away. With all the corporate tax inversion going on, I found it interesting that you report this is an Australian company hq’d in Phoenix. Looked into it. True but this is Redflex North America. Reporting to the mothership HQ in Australia. JE’s story took me back to childhood. The COPS ( constables on patrol) drove cars but hadn’t been for long. Community policing actually meant a human on foot patrolling a neighborhood. That human could use a simple hardwood stick to subdue an evildoer. How times have changed. If memory serves, the traffic-cams were a less-expensive solution to human-staffing hot spots. Some folks might claim that they were simply income producers. Do they alleviate traffic safety issues while humans can deal with real COP issues?? 7 additional “hot spots” then. Wondering where those are in the eyes of the constables. I look forward to your next posting on this matter HH. Hopefully you get all the details on Wednesday. One of the best things helping cops catch perps is the proliferation of cameras in businesses, both inside and outside. There are millions of them in use. Nothing wrong with red light cameras. The info I have seen is that they reduce collisions as people get me aware where they are. The problem for the companies that sell them is once people know where they are the quit running red lights. That’s the law of diminishing returns. As long as the returns are there they help the cause.